So, I figured that since Chris has been making regular updates to his new blog, I ought to post something more substantial. At the NE Proto Meet this year I picked up some more photos from Bob's. Of particular interest is one of T-2-b class switcher #2446 on the pit in New Britain. OK, I suppose this shouldn't be a surprise. Where the T-2-b is sitting used to be inside an engine house. Back in the '20's in addition to the local switchers assigned to New Britain, other locomotives were assigned here for other cities. For example, the Bristol switcher is stationed here. Back before the '20's there was even a turntable at New Britain. I don't know exactly when, but at some point the engine house was mostly demolished. The south wall, and the structure attached to it remained, as did the engine tracks and an RIP track. However, until I found this picture I had no idea that there was an engine pit (well, two actually) still there. So once again I need to make some changes to the layout. This is a minor one, and primarily a scenic one, but it will require me to cut out a small portion of the benchwork. New Britain Switcher at NB Engine Storage 8/48 ??? Diesel switchers (0800's) had been working in NB for over a year (3-47) at the time of this photo and 2446's career was over. So this sounds OK. 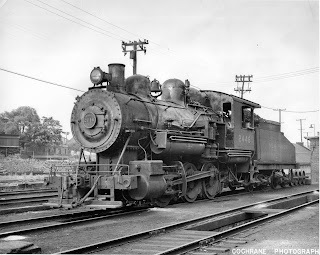 The other photo I have of #2446 is from September, 1946. Another Cochrane photo shows a 44-tonner (NH class DEY-4) on the coal trestle at Russell & Erwin in March, 1946. So the notation makes some sense. Except, in this photo #2446 looks pretty clean, has a very full load of coal, and the stack isn't capped as would be expected if it were sitting for over a year. From what I've heard, Kent didn't take great notes, and his dates are often suspect. So this could be a case of a mistaken date. But assuming the season is correct (and it's certainly spring or summer), we're talking about a 2 year discrepancy. So what difference does it make? Well, I've stated that I'm modeling 1946-1954, with the intention of swapping out scenic elements and running the appropriate equipment. Bill discussed this challenge in a recent blog post. My current focus is 1947. Since #2446 was still in service in 1947, I'm splitting the difference for now and will run one DEY-4 and one T-2-b. When the layout (and research) is more complete, then the T-2-b's may be restricted to 1946. For now I just have another great photo to help with getting the infrastructure as accurate as possible.